The Kalkfontein Dam Nature Reserve on the Riet River lies south east of Koffiefontein. The attractive nature reserve lies in amongst a series of koppies and boasts spectacular sunsets. That the land around the dam is too small to support much wildlife, gives you an indication of the size of the dam, which supports camping, fishing and picnics. The reserve’s allure of yellowfish, both the small and large mouth varieties that are a rare find in most fishing dams, are a major reason anglers head here, particularly over weekends. 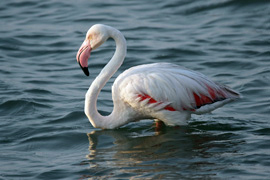 Other than yellowfish, anglers also find Orange River mudfish, barbel and carp and the water attracts a series of terns, greater and lesser flamingos. The “Diamond and Wine Route” is a very popular tourist attraction. The route follows the original diamond prospectors to the region includes open diamond mines at Koffiefontein (diamonds from this mine are sought after world-wide) and the mining village of Jagersfontein, almost directly south of Petrusburg, which boasts an even bigger man-made diamond hole than the Big Hole of Kimberley. Also on the route are the wine farms of Landzicht and Wilreza around Jacobsdal. The Horizon Tourism Route compasses towns of Philippolis, Jagersfontein, Fauresmith, Koffiefontein and Jacobsdal. With its slogan “Open spaces and little places,” the route meanders through an enchanting environment with a magic of its own. The Rolfontein Nature Reserve has been in existence since 1970 and comprises of 8 000 hectares of mountainous terrain, Karoo plains, little dolerite koppies and densely wooded mountain kloofs. 363 plant species and 53 mammal species can be found in the reserve. The reserve borders on the Vanderkloof Dam. Visitors can picnic in the reserve, or overnight in the basic tented camp. There is a 4 kilometre hike known as the Pied Barbet trail. The reserve is also a good place for sighting a fair amount of game. The white rhino, black wildebeest, gemsbok, Burchell’s zebra, springbok, various antelope and the brown hyena all put in an appearance, whilst the bat-eared fox, baboon, aardvark and aardwolf are also present at Rolfontein, if a little more elusive. This tranquil waterside Lodge is symbolic of the true South African spirit. 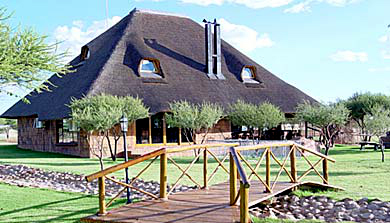 The game lodge offers luxurious self-catering chalets, a fully licensed bar and restaurant. 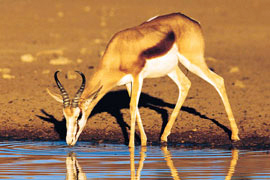 Game species commonly found at the game reserve includeLion, Buffalo, Kudu, Springbuck, Fallow-Deer, Oryx, Giraffe, Zebra, Blue-Wildebeest, Eland, Waterbuck, Lechwe, Impala, Reedbuck, Ostrich, Jackal and more. Other facilities offered include a Driving Range, Swimming pool, Fully licensed bar, A-la-carte restaurant serving dinner and breakfast, DSTV in main building, Games room with darts and pool, Organised Game drives, Bow-hunting and bird watching hides.